More than a quarter of a million people saw Rembrandt – The Late Works at London's National Gallery. Art lovers said they'd never seen anything like it. The critical reaction was ecstatic. And now Rembrandt is coming home. Late Rembrandt is at the Rijksmuseum in Amsterdam until 17 May. If you didn't see it in London, don’t miss the chance to see it here. However the Rijksmuseum isn't the only place in Amsterdam where you can marvel at the work of Rembrandt. Pick up a special map at the Rijksmuseum, called Walking With Rembrandt. It'll lead you to the Rembrandthuis, where Rembrandt van Rijn lived for twenty years. Until 17 May, in parallel with Late Rembrandt at the Rijkmuseum, the Rembrandthuis is mounting an absorbing exhibition about the younger artists he taught here. 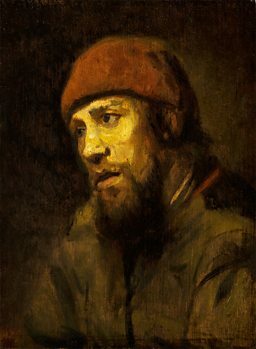 Rembrandt's Late Pupils conjures up a portrait that's as penetrating as any of Rembrandt's paintings. It's staged in the house where Rembrandt painted his greatest artworks, and played out the great domestic dramas of his life. When Rembrandt bought this handsome merchant house, in 1639, his life was full of promise. He was 33, with a growing reputation and a wealthy wife, Saskia, whom he adored. This house cost 13,000 guilders, a lot of money, but money was not a problem. He'd just been hired to paint The Night Watch, his most celebrated painting. He took out a large mortgage. 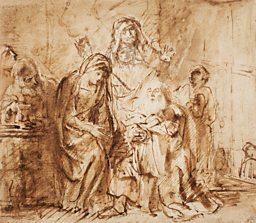 In 1641, Rembrandt's son Titus was born here, but the birth left Saskia weak and tired. She died here in 1642. Rembrandt hired a nursemaid, called Geertje. They became lovers. When he left her for his young housekeeper, Hendrickje, Geertje sued him for breach of promise. This dispute dragged on for years. 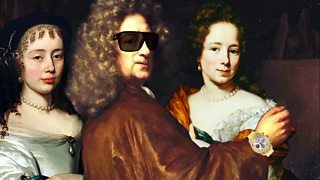 As Rembrandt's art evolved his fortunes declined. His mature work was looser and rougher. Rich patrons preferred something slicker. He could no longer pay the mortgage. In 1658, he filed for bankruptcy. The Rembrandthuis was sold. In 1911, after several centuries in private hands, it was earmarked for demolition. The city council rescued it, and turned it into a museum. Nearly a quarter of a million people came here last year. Bankruptcy was a calamity for Rembrandt, but it was a godsend for this museum. Rembrandt had to sell the contents of this house to pay his creditors. The auditors made a list of everything he owned. From this inventory, the curators have reassembled the contents of his house, right down to his favourite furnishings. They also drew on the many sketches he made here. The result is intensely atmospheric. It feels as if he's still around. 'His own house figures in many aspects of his work,' says David de Witt, the Chief Curator, as he shows me round. This was his home, but it was also his workshop and his showroom. The most evocative room is his sunlit studio, where so many of his paintings evolved. In a way, it's still a workshop. Visitors are taught to make their own artworks here. Rembrandt wasn’t a solitary artist. He was also an art dealer, and a teacher. Rembrandt's Late Pupils charts the progress of his protégés, who toiled away upstairs. 'Your pupils had to learn your style, and your methods,' explains de Witt. 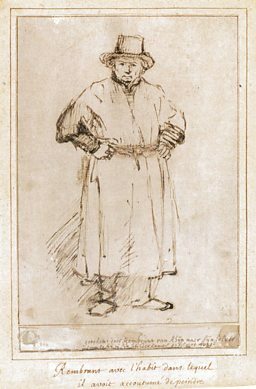 Rembrandt was a tough teacher, but his pupils strove to please him. 'Sometimes I was so saddened by my master's hard instructions that I would not eat or drink and slake my thirst with my tears,' wrote one of his pupils, Samuel van Hoogstraten. Not all his pupils were quite so starstruck. Gottfried Kneller moaned about Rembrandt's gutsy approach, 'where exact design and true proportion were wanting.' Kneller knew which way the wind was blowing. Pupils like Nicolaes Maes adopted a more precise technique, and prospered. 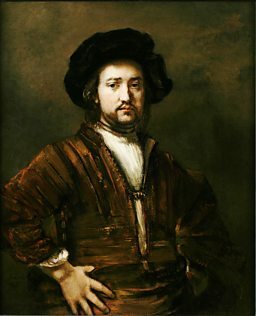 Others, like Willem Drost, remained loyal, even after Rembrandt became unfashionable. Drost was so faithful to his master that some of Drost's paintings were mistakenly attributed to Rembrandt. Drost died in 1659, still only in his mid-twenties. Hendrickje died a few years later. In 1668, Rembrandt's beloved son Titus died, also in his mid-twenties. Rembrandt was heartbroken. He died the following year. His most famous painting, The Night Watch, painted in the Rembrandthuis, now hangs in the Rijksmuseum. The entire museum was built around it. There are several Rembrandts in the Rembrandthuis, but it's his pupils' pictures which are most intriguing. Poignantly, some of the best works are by one of Rembrandt's most obscure apprentices, Abraham van Dijck. 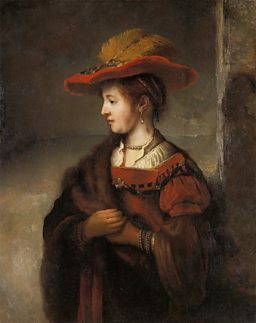 Van Dijck painted a flawless copy of Rembrandt’s portrait of Saskia (Rembrandt had to sell the original, to pay his debts). 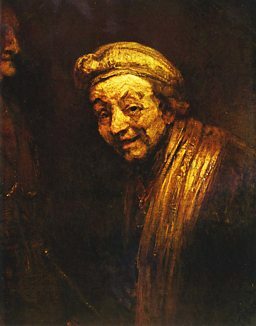 Van Dijck's Jacob & Benjamin bears comparison with Rembrandt. It evokes emotion through restraint. It reveals what Jacob is really thinking. Everyone knows Rembrandt was a great painter. This exhibition proves he was a great teacher, too. Back at the Rijksmuseum, there are crowds around The Night Watch. It feels strange to think of Rembrandt painting it, in that bare studio a short walk away. So many people are gathered here, you can barely see the painting. Some are taking selfies, but most of them are simply drinking in the view. 'What an infinitely sympathetic painting,' reflected Van Gogh, the first time he saw Rembrandt's The Jewish Bride. Van Gogh was spot on. This is the essence of Rembrandt's genius. It's his sympathy for humankind which makes his art eternal. In the paintings of his pupils, some of that unique sympathy survives. After his triumphant trip to London, Rembrandt is back where he belongs, in Amsterdam. Welcome home. Rembrandt's Late Pupils is at the Rembranthuis, Amsterdam from 12 February - 17 May 2015. Late Rembrandt at Amsterdam's Rijksmuseum isn't quite the same show as Rembrandt - The Late Works at London's National Gallery. If anything, it's even better. The gallery is bigger, so there's room for four more paintings, including a perceptive study of Rembrandt's friend and patron, Jan Six, and a demonic self-portrait, in which the artist resembles a cackling old crone. The Family Portrait is a tender depiction of a loving family. 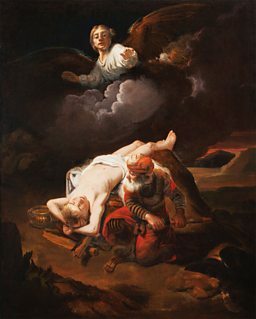 Jacob With The Angel completes this new quartet. As you stand before these intimate paintings, you can see exactly what he means. These late Rembrandts are so subtle and insightful that you can view them time and time again, and still find something new in them every time. What makes The Night Watch so iconic, and did Rembrandt's most famous painting end his career?